Serendipity and bitcoin bring people together all over the world! A short story about how life can bring you together without even knowing it did. We have been on Koh Phangan for 3 months now and we met many very interesting people. A few days ago we again had a strange story of serendipity. Our youngest daughter Jessa has been playing with Antalia, a French girl, for 2 months now. We met the parents but we just daily greeted each other. The family has been traveling for 5 years now and was in Nepal some time ago. In Nepal a friend of them told them about crypto and that there was a family that sold everything they had to buy Bitcoin. Since then they talked a lot about Bitcoin and whether to buy it or not. At that moment we have been staying for 2 months in the same resort without them knowing that we were this family they heard about in Nepal. 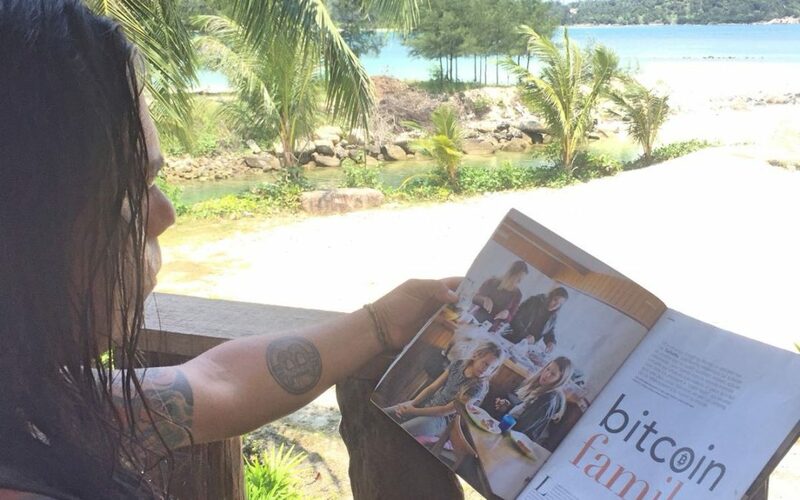 A few days ago a French friend visited them in the resort and brought them some French magazines to read. One of the magazines was Society and we were in it. They recognized Jessa from the picture and then realized they were greeting us for 2 months without knowing we were the family they previously heard of. They immediately came to us and told the story how they heard about us. We laughed about it and agreed that meeting each other was meant to be. Of course, they quickly started asking questions about whether to buy Bitcoin or not. I started to tell our story, our view on crypto and what we did. They decided to buy Bitcoins because meeting us couldn’t be a coincidence. It’s so strange how life seems to connect people to each other at the right moment. Why did I share this with you? Because 1). To show you how huge Bitcoin is becoming and that even in Nepal in the mountains people talk about it. 2) How things, that seem to randomly happen, often happen for a reason, serendipity. If you take time to look around and pay attention to people, you are able to see amazing things you would not have seen if you just run the hamster wheel. If you walk the same circle every day and if you are continuously living in your head it’s not easy to spot the magic of life. Start discovering the world and just break the circle you live in, create some space and open up to new amazing things in life. And no you don’t have to start traveling the world for this. You could, for example, next Monday after work, not directly go home but stop somewhere randomly on the way back and to take a walk in a village where you would normally not stop. Say hello to new people and have a short chat with them or offer to help somebody that needs it at that moment. Just see how it feels and if you like that feeling. You wouldn’t have felt like that if you just drove past that village to get home as fast as possible to continue the daily routine. These small things will make you realize that there is more to life than just running the hamster wheel. Want to start buying bitcoin visit this page here on our website. Do you want to see more about our life? check our youtube channel. I just saw a program on French-German TV channel Arte. In an interview, you explain how one can borrow a large amount bitcoins, shared across a bunch of people, and pay each of them 2% of interest each month. The female journalist tells you that it’s a low interest rate. And you agree… in the French, German, and Spanish translations. But that’s actually 24% interest per year! So, the quickest way to making tons of money is to lend you some, or what?? Lending is only profitable when bitcoins are making money.. they have only lost value since beginning this year… it remains an investment that has risk (as has any investment). Investing in bitcoins is pretty high risk, so only do so with money you can aford ro loose..